Al Khail Avenue ... poised to be a new retail hub in Dubai. 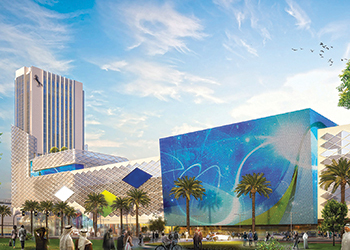 Nakheel has appointed the main contractors for two of its key retail hubs in Dubai UAE. 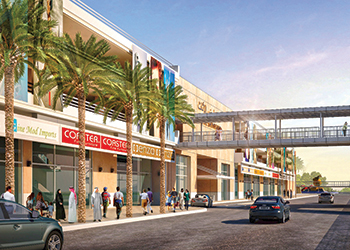 The Dubai-based master developer has appointed Dhabi Contracting to undertake the construction of Al Khail Avenue retail, dining and entertainment hub under a contract worth Dh1.5 billion ($408.28 million) and Al Ghurair Contracting & Engineering Works (Al Ghurair CEW) to construct its new 375,000-sq-ft showroom complex at Dragon City for Dh117.5 million ($32 million). UAE-based Dhabi Contracting will begin construction work on Al Khail Avenue early next month (October). Earthworks at the site – alongside Al Khail Road on the edge of the Jumeirah Village Triangle (JVT) community – were completed in June. Scheduled for completion in Q1 2019, the 2-million-sq-ft Al Khail Avenue has more than 1.2 million sq ft of leasable space, of which around 70 per cent is booked. Confirmed outlets include a 14-screen Reel Cinemas complex, a Waitrose supermarket and a wide range of fashion, children’s, home and electronics stores. There will also be a multitude of cafes and restaurants, plus a 4,000-slot multi-storey car park which can be accessed directly from Al Khail Road. New showrooms at Dragon City ... an artist’s impression. Situated amidst several established or rapidly-developing residential communities and close to commercial hubs including Jafza and Dubai World Central, Al Khail Avenue is a convenient shopping and entertainment facility for people living nearby. Nakheel is also planning a 252-room hotel in the new hub. Directly connected to Al Khail Avenue and its 350 shops, restaurants and entertainment outlets, the 18-storey hotel will feature an all-day restaurant, coffee shop, lounge, outdoor terrace, pool deck gymnasium and car park. Dhabi Contracting, established in 1983 as a ‘Special Category’ contracting company, has built its reputation by introducing innovative state-of-the-art technologies in concept, development, design, planning, scheduling and execution of projects. It undertakes diversified turnkey construction projects with in-house capabilities for specialised jobs in the field of civil engineering works and electro-mechanical engineering works. The sphere of its activities include industrial, commercial, institutional, high-rise residential and luxurious villa complexes and sewerage projects. Meanwhile, Dubai-based Al Ghurair CEW will begin construction work on the new 375,000-sq-ft showroom complex at Dragon City in two months time. The new retail centre, which will have 18 showrooms and a multistorey car-park for 900 vehicles, is scheduled for completion in Q4 2018. The Dragon City showroom project comes hot on the heels of Dragon Mart 2 – the new Dh1-billion ($272.18 million) complex that doubled the size of the original Dragon Mart to 3.5 million sq ft when it opened earlier this year. Dragon City, home to Dragon Mart, is undergoing extensive expansion in the form of new retail, hospitality and residential components that, when complete, will bring the size of the development to 11 million sq ft.
Al Ghurair CEW was formed in 2007 as part of Abdullah & Hamad Al Ghurair Investment Group.